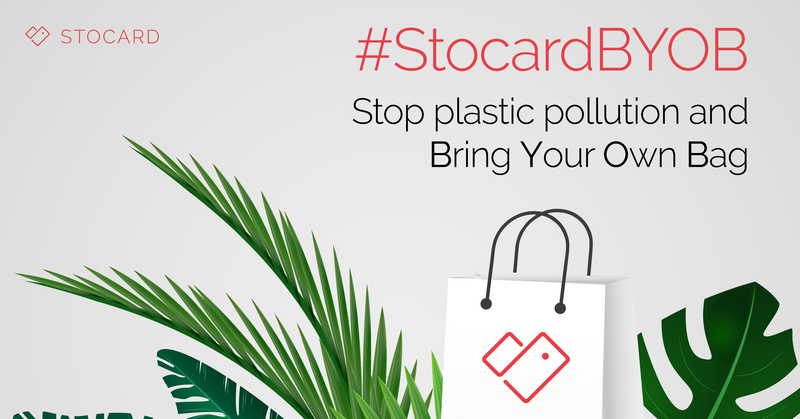 Sydney, Australia, 5 June 2017 – Leading mobile wallet app, Stocard, is rolling out its #StocardBYOB (Stocard Bring Your Own Bag) social awareness campaign targeted at Aussie shoppers to coincide with World Environment Day, and in support of the trending #BanTheBag conversation and petition initiated by Greenpeace Australia. At 12:00pm on Monday, 5 June – World Environment Day – Stocard will be sending a push notification to its 1.7 million Australian users to remind them to BYOB (Bring Your Own Bag) in a bid to reduce the 10 million+ disposable plastic bags used by Aussies each day. Stocard’s traditional red logo will also be getting a makeover to mark the occasion with all its social media accounts converted to green for the entire month of June. Social content via Facebook, Twitter and Instagram aims to encourage greener thinking and drive into public consciousness the harmful impacts of plastics, which include plastic carry bags as well as plastic loyalty cards. To date, Stocard has helped make 150 million plastic loyalty cards obsolete by enabling customers to upload their loyalty program data straight onto the app, which can then be scanned in-store directly from the customer’s smartphone to accumulate points, in addition to receiving personalised offers from favourite retailers and viewing current points balances and transactions in real-time. Originally founded in Germany, Stocard has a huge European foothold and has seen the positive impact of the European Union’s (EU) 2015 directive that insists its member states must reduce their average plastic bag consumption from 200 bags per person in 2015, to 90 bags per person in 2019, and 40 bags per person by 2025. Radinck van Vollenhoven, Country Manager of Stocard Australia and New Zealand, said, “Stocard is passionate about helping to reduce the environmental damage caused by the printing and production of plastic cards, as well as educating consumers on the toxic effects of plastic to the environment and our wildlife when discarded materials are dumped into landfill or left to litter. “The use of plastic in the retail industry is hugely driven by convenience and it’s critical that we come together to tackle this issue. We need to foster change in consumer behaviour and motivate people to bring their own bags. Europe has been a global frontrunner in the reduction of plastics and has already made fantastic progress with small changes – we are confident we can achieve this locally. “In the UK, for example, by simply charging £0.05 for each plastic bag, its top seven retailers reduced the number of single-use carry bags from 7.6 million in 2014 to 0.6 million in only six months. This simple solution helped to incentivise consumers to bring their own bags and benefit retailers. It’s an all important step towards a brighter future for our environment,” added van Vollenhoven. Stocard is currently in talks with several organisations about rolling out future campaigns in this space to drive more awareness to Australian consumers and create more sustainable outcomes. Stocard was founded in Mannheim, Germany in May 2011 where its headquarters is based, with offices recently opened internationally in Australia and Italy. Stocard lets users store all their loyalty cards in one place – on their smartphones. With more than 15 million global users, Stocard is the leading wallet app for loyalty and combines smart technology with maximum usability. A simple scan feature lets users scan every card and add it digitally to the app. Moreover, targeted offers from retailers can be received by users. In the near future a payment solution will be added in order to implement a complete mobile wallet. For more information, visit www.stocardapp.com.